Let money solution for unexpected financial status of people may actually get repaid from. In It Magazine is an independent, Internet-based music magazine that focuses primarily on the innovative, non-mainstream musicians who deserve more attention than your local radio station may be willing to give them. The African Children’s Choir has had the career that most musicians strive for. Founded in 1984 by Ray Bennett, they have performed for world leaders, been featured on various movie soundtracks, and shared the stage with Paul McCartney. Through their music and live concerts, they have raised millions of dollars and are using the proceeds to help ensure a brighter future for themselves and their communities. Currently helping to provide support for nearly 7,000 African children, the money the children have raised has helped to build schools, cure the sick, and aid those in poverty. They, in short, are showing us all that music really can change the world. 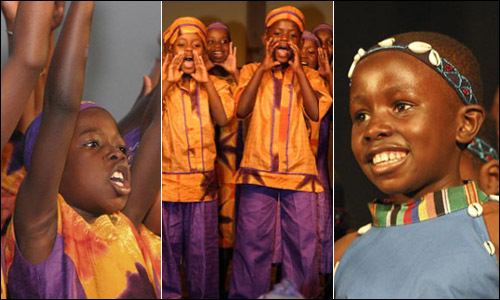 If you would like to see the African Children’s Choir perform live, they are currently on tour in the U.S. and will be continuing on to Canada in January 2008. Tour dates, donation opportunities, and more information on the Choir can all be found on their website, AfricanChildrensChoir.com.